Ross Castle (Caisleán an Rois) wurde im 14. Jahrhundert auf der Halbinsel Ross Island im Lough Leane errichtet. Die Burg liegt strategisch günstig und war die letzte bedeutende Festung Irlands, die Cromwell Widerstand leistete. Danach war sie viele Jahre im Besitz der Familie Brown, den Vicomten Kenmare - der Familie von Thomas Brown dem Gründer von Killarney. 1825 wurde die Burg verlassen und verfiel, bis sie 1970 vom irischen Staat übernommen wurde. Das Office of Public Works restaurierte Ross Castle im Stil des 17. Jahrhunderts. Ross Castle (Caisleán an Rois) was built in the 15th century on the peninsula Ross Island in Lough Leane. 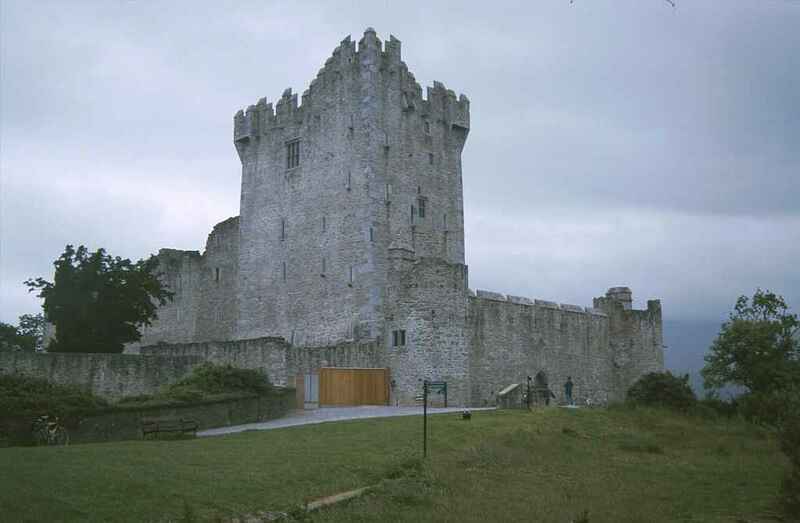 The castle is situated strategically and was the last significant stronghold in Ireland resisting Cromwell. Afterwards it was in the ownership of the family Browne, the Viscounts Kenmare - the family of Thomas Browne, the founder of Killarney. 1825 the castle was abandoned and it decayed, until it was taken over by the Irish state in 1970. The Office of Public Works restored Ross Castle in the style of the 17th century.